This is an event no witch in London should miss - an exhibition of images from the Museum of Witchcraft in Boscastle plus the launch of the book Of Shadows: One Hundred Objects from the Museum of Witchcraft and Magic by Sara Hannant and Simon Costin. 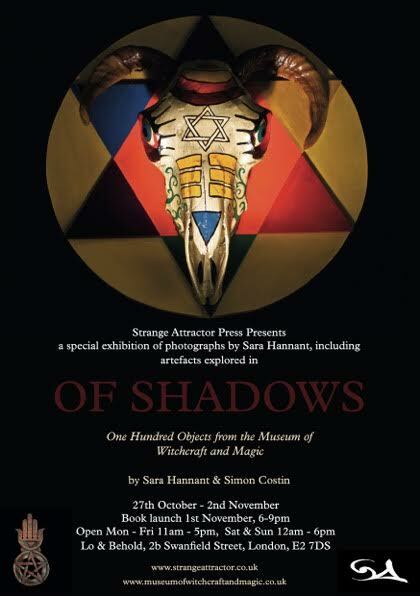 The photographs are all by Sara Hannant, whose work over the past ten years has explored magical belief, seasonal cycles and folklore. In 2011, the Horniman Museum launched her touring exhibition Mummers, Maypoles and Milkmaids: A Journey through the English Ritual Year. Her book of the same title received the runner-up Katharine Briggs Folklore Award in 2012. She has also exhibited at The Cob Gallery and Forty Hall in London, and the Towner Gallery in Eastbourne. I've tried to get to all her events - but this one promises to be the most interesting so far. The work is all inspired by Sara's recent artist residency at the Museum of Witchcraft. She gave a preview of some of her pictures at Treadwell's earlier this year, at the talk Witchcraft's Artefacts. Sara says she considered the relationship between photographic practices and magical belief by capturing the essence of carefully selected artefacts including wax dolls, wands, statues, daggers, pendants, robes and amulets, all used in witchcraft and magic. Some of the objects have been displayed at the museum for years, others have long been hidden in its archives. In witchcraft, magic aims to bring about change and sometimes objects are made or charged with magical intent for this purpose. Similarly, Sara believes the photographic process can transform objects, images, and ideas that contribute to its meaning. Her photographs and projections, shown alongside museum artefacts at the exhibition, explore the magical properties of the photographic process and engage the viewers’ imagination in the act of transformation. Sara explains: “It was best to photograph at night. This enabled the objects to emerge from the darkness, where it is said magic begins. Reflecting on this process, I found parallels with photographic practice. Superstition and magic have encircled photography from the beginning. In many cultures, the word for photography/photographer translates as ‘soul taker,' ‘shadow catcher,' or ‘face stealer'. The camera itself was perceived as a magical object, and photographs were thought to possess supernatural powers." Lovely review. I'm enjoying reading it too. And very nice to meet you at the launch/exhibition.